Keep up-to-date with Fox News Radio, Radio Iowa, Brownfield & the Iowa Agribusiness Networks! Check our Program Schedule Page for times! Officials with the Shenandoah Police Department reported on their social media page Wednesday night, that an in-depth criminal investigation led to the arrest Wednesday, of 28-year old Samantha Danielle Hull, whose place of residence was not listed. Hull was charged with False Reporting to a Public Safety Entity – a serious misdemeanor. She was able to post $1,000 bond and was given an initial appearance date in Page County Court. 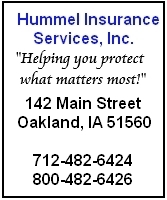 Recently the Iowa Department of Human Services (DHS) announced that AmeriHealth Caritas Iowa, Inc., will be withdrawing from the IA Health Link program. The DHS says it is “focused on ensuring members will continue to receive quality care and to make this transition as smooth as possible.” AmeriHealth Caritas members were tentatively assigned to UnitedHealthcare as Amerigroup Iowa does not currently have the capacity to take additional members. Members were notified they were able to make choice to change their Managed Care Organization (MCO), as member choice is a key component of managed care. Amerigroup Iowa has informed the Department they do not currently have capacity to take any new members. The Department has been in communication with the Centers for Medicare and Medicaid Services (CMS) to keep them informed of what is happening, and will continue to do so. All new IA Health Link members will be assigned to UnitedHealthcare. 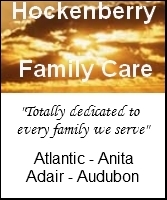 In the future members again will have a choice in MCOs and will be notified when that choice is available. The Department, along with its managed care partners, says it is working diligently to get member information transferred to UnitedHealthcare, to make sure members and providers are informed, and identify and address areas of concern. To learn more about AmeriHealth Caritas withdrawing from the IA Health Link program and about the suspension of MCO choice, visit www.IAHealthLink.org. A decade ago, 127 publicly-owned lakes in Iowa were placed on a list as candidates for restoration efforts. Improving water quality and increasing public use of a lake are the two primary goals of the program. A recent Iowa State University study found at least six out of 10 Iowans visit an Iowa lake more than once a year. The Montgomery County Sheriff’s Office reports two men were arrested on separate warrants for Probation Violation, Wednesday. A little after 6-p.m., Deputies arrested 31-year old Aryon James Goodman, of Moulton, IA, on two felony counts of Probation Violation out of Appanoose County. He was taken into custody in the 1600 block of N. Broadway Avenue and brought to the Montgomery County Jail, where his cash bond was set at $10,000. And, at around 8:25-p.m., 41-year old Daniel Elmer Bright, of Corning, was arrested in the 100 block of W. Coolbaugh Street, in Red Oak, for Probation Violation. Adams County Sheriff’s Deputies assisted in making the arrest. Bright was being held in the Montgomery County Jail on a $2,000 cash bond. DES MOINES, Iowa (AP) — A Waterloo man who sent threatening tweets to U.S. Sen. Joni Ernst has been convicted by a jury of sending threatening communications. A federal jury in Cedar Rapids reached the verdict for 34-year-old Joseph Hilton Dierks on Wednesday after five hours of deliberations. ADEL, Iowa (AP) — A Polk County prosecutor has been charged with child endangerment, accused of striking a child. Court records say Joseph Crisp pleaded not guilty Monday in Dallas County Court in Adel. His attorney didn’t immediately return a call Wednesday from The Associated Press. The complaint says Crisp used an open hand to strike the child across the back on Nov. 15 as punishment for defecating in a diaper. LA CROSSE, Wis. (AP) — Kwik Trip is planning to make a $300 million capital investment to support its convenience store chain. Plans by the La Crosse-based retailer include a $113 million bakery plant, expanding its dairy manufacturing facility, kitchen operations and transportation fleet. The investment is expected to create more than 300 jobs in the La Crosse area over the next five years. MOLINE, Ill. (AP) — An airport in western Illinois is launching an initiative to encourage area businesses along the Illinois-Iowa border to prioritize flying local. The Quad-City Times reports that the Fly Local Alliance program comes as the Quad-City International Airport in Moline works to retain and increase passengers. Airport officials say participating companies won’t pay a membership fee. In exchange, companies promise to communicate with airport officials about their travel spending. U.S. Capitol Police contacted the Waterloo police and officers to Dierks’ home say he promised to “tone it down.” Within 24 hours he was sending more threatening tweets to Ernst. Thousands of Iowans will be cooking their very first Thanksgiving turkeys tomorrow, and for those newbies, certain rules need to be followed when handling the big bird. While the Butterball Hotline offers some important cooking tips, so does the Iowa Statewide Poison Control Center. Registered nurse and poison center educator Joan McVoy says it’s vital to thaw frozen turkeys properly. Take care to follow the directions on pre-heating and cooking temperatures when popping the big bird in the oven. Food handling is also important -after- the big meal to prevent food-borne illnesses. If you have questions, the Sioux City-based Iowa Statewide Poison Control Center is staffed around-the-clock and it’s a free call at 800-222-1222. Over the past decade in Iowa, the state’s Department of Transportation reports the Thanksgiving weekend has produced 25-percent more fatal crashes than any other holiday weekend. The night before Thanksgiving is a particularly dangerous time because of alcohol-impaired drivers. Last year in Iowa, five people were killed in traffic crashes over the Thanksgiving holiday period – which runs this (Wednesday) evening through Monday morning. Des Moines – The Iowa Finance Authority and the Iowa Department of Natural Resources recently announced that 26 Iowa communities have received low-interest water quality loans totaling more than $82.8 million through the State Revolving Fund. Among the communities to receive the loans, is Shenandoah, which received $833,000 for Sewer treatment improvements. State Revolving Fund Construction Loans are a low-cost construction financing option available for Iowa cities and municipalities for water quality initiatives. Planning & Design Loans are zero percent loans that assist with the first-phase of project expenses. The State Revolving Fund has awarded Iowa communities and municipalities with more than $2.8 billion in Construction Loans and more than $175 million through Planning & Design Loans since the program’s inception. The U.S. Environmental Protection Agency provides annual capitalization grants to states. Leveraged bonds and loan repayments expand the reach of the federal investment. More than $3 in assistance has been leveraged for Iowa water quality projects for every $1 of federal funds. More information is available at IowaSRF.com. 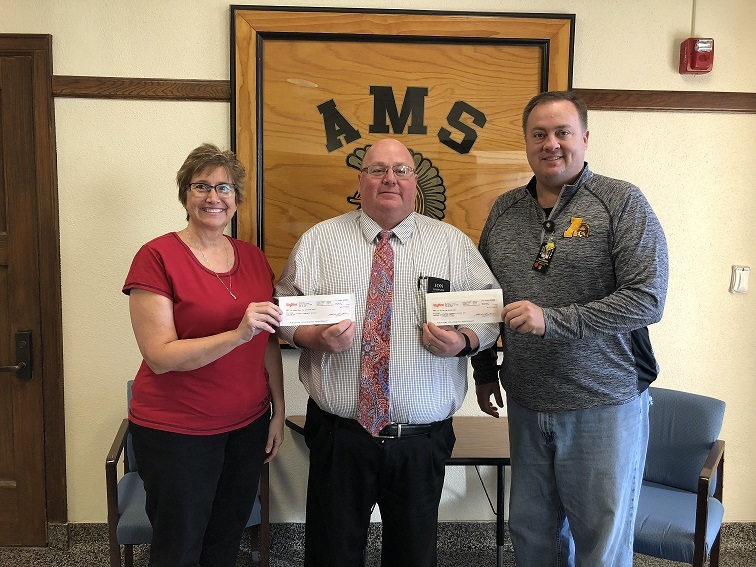 Officials with the Atlantic Community School District are pleased to report Atlantic Hy-Vee Manager Jon Johnson recently presented a check in the amount of $5,262.50 to the District. Johnson explained how the fundraiser worked. He said they sold muffins, cookies, Angel Food cake, etc., in an effort to help the school out. He said the funds will be used for a variety of purposes associated with the School District. The money will be used for student activities and food services. Washington Elem. 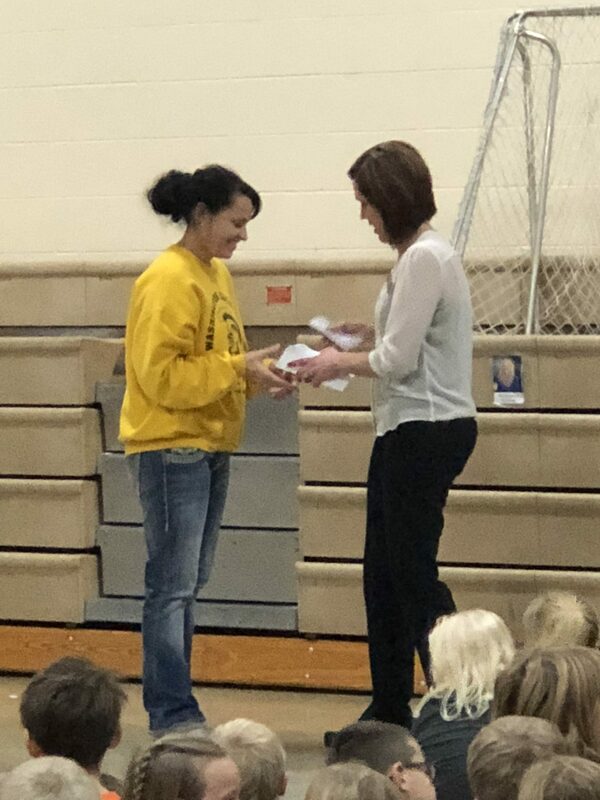 Principal Stacy Hornung receives box tops from Hy-Vee’s Steph Dagel. Assistant Hy-Vee Director Stephanie Dagel, also presented Washington Elementary with 10,000 box tops. Atlantic was one of three stores to win a General Mills contest. The box tops can be cashed-in by the District to purchase whatever supplies the schools may need. Superintendent Steve Barber extends a big Thank You to the Atlantic Hy-Vee, for their donations! (Left to right) — Atlantic School District Food Service Director DeeAnn Schreiner, Hy-Vee Mgr. Jon Johnson and AHS Asst. Principal/A.D. Matt Alexander.